For centuries, the family meal has centered around a steaming pot of soup. 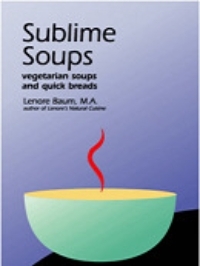 Sublime Soups makes it easy to continue this tradition, even with today's busy lifestyles. In fact, soup even taste better the next day! Let Lenore show you how easy it is to build nutritious and satisfying low-fat meals around soup, quick breads and salad.